We’ve been in the midst of picnic season in North Texas lately, so picnic food has long been on my mind. Sandwiches are my go-to, especially egg salad, tuna, and a bizarre TVP concoction I’ve been eating since I was a kid. At the crux of all small picnic sandwiches are my favorite store-bought bread – King’s Hawaiian rolls. Soft, fluffy, sweet – they’re one of those foods I could eat for every meal, and polish off the whole bag in a day. Of course, I’ve longed to make my own. These are not quite the same as the standard King roll – they aren’t quite as fluffy, a little denser, especially if you make them with some whole wheat flour, but they also don’t come with hundreds of unpronounceable ingredients. The beauty is that you can customize them to fit any sandwich – small for picnic sandwiches, big for hamburgers, etc. They do need to rise for a substantial amount of time (that’s why they’re fluffy! ), but they aren’t much work otherwise. 1. Beat the eggs and add the pineapple juice, sugar, salt, ginger, vanilla, and melted butter (I use my stand mixer). Stir together until combined. Add the yeast and mix until the yeast is fully incorporated. Add the flour, one cup at a time, waiting for each to fully incorporate. Continue to add flour until the dough is sticky, but not overly wet (usually 7 gets it there for me). Continue to knead the dough either with a bread hook or your hands until it forms a soft ball. Transfer to a greased bowl and allow to rise for a few hours, until doubled in size. 2. Once doubled, punch the dough down and roll sections of dough into individual rolls (I shoot for ping-pong ball sized). Place these into a greased pan – I usually fill one 9×13 pan and one 8×8 pan. Place the rolls far enough apart to allow them to double in size. 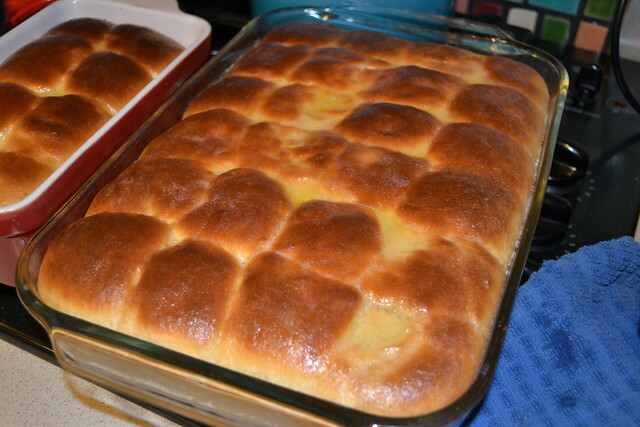 Cover with a dishtowel and allow to rise for another hour or two until the rolls have doubled in size again. 3. Bake at 350 for about 25 minutes. Overbaking will cause these to become crunchy, so be sure to pull them out before they get too brown.